On Tuesday night, we went to Luke's band concert. We do this every couple of months or so, but this one felt kind of felt bitter sweet because I realized it's one of the last high school band concerts in which our sons will be participating. It again makes me ask, "Where does the time go?" On Thursday night, I headed to Total Wine with my buddies Troy and Tom for a "Whiskey Tasting Event". I've never been much of a Whiskey Man before, but it sounded like an interesting opportunity to learn and taste various types of Whiskey from around the world. They taught us the various processes involved in distilling it and aging it in barrels. The people around me all thought they could really taste the differences and used adjectives like smooth and tangy peaty and identified tastes like caramel, nutmeg, and strawberries. To be honest, it all tastes like liquid fire to me. I have no idea how anyone could justify spending $4000.00 on a bottle of whiskey. There's no way it tastes any better than a $3000.00 bottle. On Saturday, we went to downtown Minneapolis to the Convention Center and the 2017 Twin Cities Auto Show. We went with our good friends, the Zitzewitz Family. They're always up for a new kind of adventure with us. There were so many fast and beautiful cars, we didn't quite know where to begin. Technically this Polaris Slingshot is a motorcycle, so not sure why it was at the auto show. 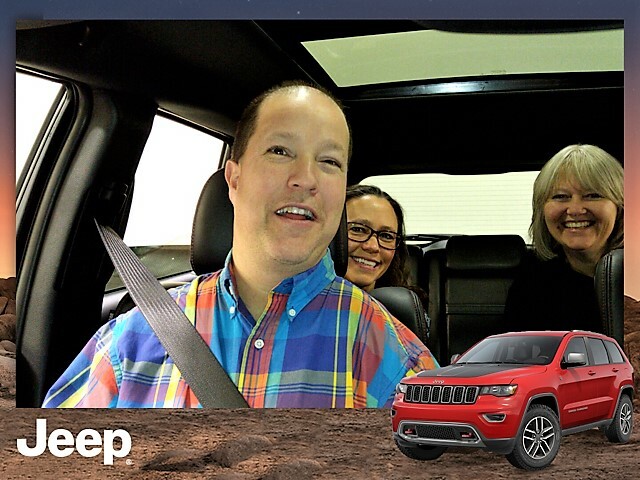 Jeep had a really cool exhibit where they gave us rides in their various vehicles and took us "Off-Roading" through an indoor course. They even took pictures of us while riding. Lucky they snapped this one when they did because I was actually screaming in fear throughout most of the ride. Karl looks good in a Mercedes, but he has a tough time getting rid of this surprised look every time he sits behind the wheel. I can see how this could be kind of an expensive show if I was one of those fathers who bought their kids nice cars. Lucky for me, I'm not one of those kinds of fathers. Miss Sheri has always dreamed of driving a new Mustang. Lucky for me, I'm not one of those kinds of husbands either. I tried to convince Miss Sheri that we don't need a new car at all. We just need to talk the Zitzewitzes into buying one and then they can give us rides everywhere! Ana isn't old enough to drive quite yet, but in a couple of years I'm going to trick Karl into buying her this vehicle and then she can drive Luke and I around also. Our transportation problems are almost solved then. I want a job like this working at the auto show. I'm just afraid I'd get too dizzy spinning around in a circle like this all day. We looked everywhere we could to find Lego Batman, but he must have been taking a bathroom break or something. I thought it was a pretty nice place to hold an auto show, but when I spotted the rat it just made me feel like the place was kind of dirty. Toyota has a neat virtual reality demonstration where you could witness what it was like to drive around in one of their vehicles. I was fascinated with it. All was good until Luke was busted trying to drive one of the vehicles out of the show and the rest of the day went downhill pretty quick.